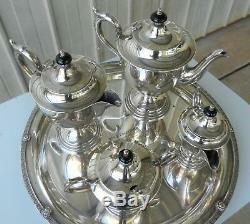 VINTAGE 5 PIECE TEA / COFFEE SET. 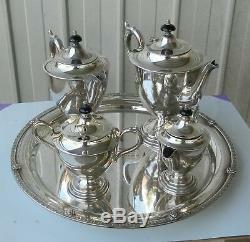 Extremely fine quality vintage "Du Barry" Paramount tea set made by Australian company K. The set consists of teapot, coffee pot, creamer jug and sugar pot with black Bakelite finials and dainty floral rims around the tray. Tray engraved with Mrs E. In appreciation of 14 years service. G + R Wills and Co. Tray Measures 30cm Dia x 30mm H. Creamer Jug Measures 15cm from spout to edge on handle x 15cm H. Sugar bowl with spoon measures 17cm across from handle to handle. 11cm Dia x 16cm H, Spoon 14cm Long. 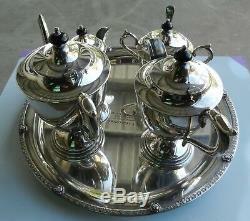 Coffee pot measures 21cm across spout to handle x 22cm H x 12cm Dia. 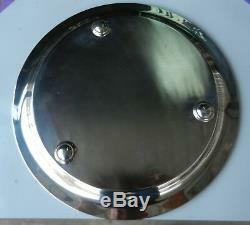 Tea pot measures 23cm across from spout to handle x 13cm Dia x 23cm H. Pictures help form part of the description. Check out my other items. Be sure to add me to your favourites list. 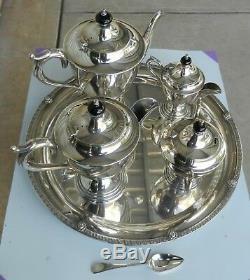 The item "VINTAGE 5 PIECE TEA / COFFEE SET PARAMOUNT TRIPLE SILVER PLATE EPNS" is in sale since Friday, March 1, 2019. 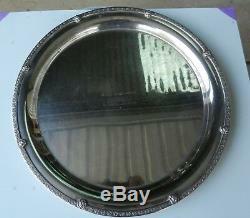 This item is in the category "Collectables\Homeware, Kitchenware\Tableware\Serving Pieces". 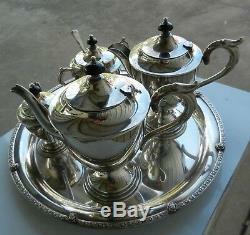 The seller is "ccsparts" and is located in Adelaide, SA. This item can be shipped worldwide.